Dental implants are a way to replace one or more missing teeth. They do not rest on other teeth like a bridge, or on the gum, like dentures. They are placed directly into the jawbone surgically. As the bone grows, it fuses to the titanium post, making it permanent. It provides a strong foundation for tooth/teeth replacement. The best candidates for dental implants are adults who are missing teeth due to decay, trauma, gum disease, congenital defects, or other health conditions. Long time denture wearers who wish to improve their speech and chewing are candidates for implant dentures. Advanced age is not a factor when it comes to dental implants; the success rates for implant integration are the same for a 30 year old, as a 60 year old, and as an 85 year old. Children (age 17 or younger) are not typically candidates for dental implants because of their developing jawbone, however, Dr. Courey has experience in providing children with congenital defects like being born with missing teeth or without teeth, with interim tooth replacements until they are old enough to receive a permanent, long-term restoration. 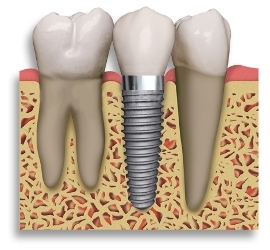 If you are missing one tooth, Dr. Courey can place an implant crown over the new titanium root, which is nearly indistinguishable from your natural teeth. If multiple teeth are missing, there are many options for implant supported tooth replacements. You may choose multiple implants to recreate individual teeth, or an implant supported bridge to replace several teeth, or even an implant supported denture to replace an entire arch or missing teeth. Although that are a number of restorative options for the treatment of missing teeth, none have proven to be a functional and durable as those supported by implants. In many cases implants may be the only logical choice for the restoration of all necessary functionality of the teeth and supporting structures. natural teeth as a bridge does. They provide far more efficient chewing and speaking than conventional bridges and dentures, which can move and slip. Implant restorations are incredibly successful and long lasting, saving the patient time and money in the long run. Implants offer a permanent solution to tooth loss. To find out if you are a candidate for dental implants and what your restoration options are, call Manalapan Prosthodontist, Dr. James Courey to schedule a consultation. He and his team will take excellent care of you.